A memory sketch of a gentleman i saw enjoying some of the nice weather we have been having. He looked like he had "seen some stuff" over the years, so I wanted to portray him as a retired mafia hitman. Drew this for another fun contest over at Sketchoholic with host Stephen Silver . Ballpoint pen and Photoshop colours. thanks jason! 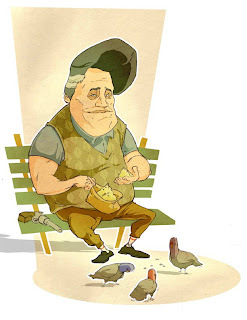 feeding the pigeons helps him forget the past.